The Echo du Berry comes out on a Thursday. It’s one of our local weekly papers, and probably the most popular. Everyone seems to read it. The Echo itself reckons it has around 60,000 readers for the 13,300 copies it sells each week (2010 figures). Since it covers an area with a population of 110,000, that’s a pretty impressive readership figure. The Echo began life in March 1819 as Petites Affiches. It later became L’Echo de l’Indre before taking the name L’Echo du Berry in 1950. These days it covers national issues, all the local news area by area, agriculture and the environment, and it has traditional Berry recipes, a short section on local history, classified ads, Sudoku and a what’s on section. It’s compulsive reading. We feature in quite regularly. I’ve made a point of keeping in contact with the journalist for this area. The Echo is a slightly unusual local paper in that its readership covers several different départements, and they’re not all in the same région. This is because Berry is a historical region and a former province of central France. The French Crown bought it in 1101, and then in 1360 it became an independent duchy before being taken over by the Crown again in 1601. It remained a province until 1790, when it was replaced by départements following the Revolution. Berry now consists of the départements of Cher, Indre and parts of Vienne and Creuse (including us). So as well as being a Nouzerinoise (female inhabitant of Nouzerines), I am also a Berrichonne (female inhabitant of Berry). As well as its own successful weekly paper, Berry has other famous products. The Sucrine du Berry is one of these. It’s a very old variety of squash. After reading about it in the Echo du Berry (where else?) 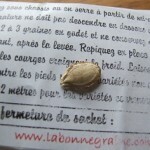 I tracked down some seeds to grow this year. 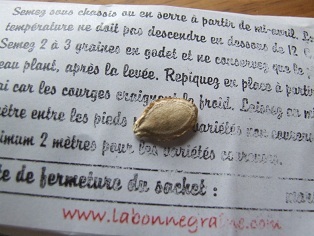 The end product should be a lovely big, dark green, pear shaped squash with golden flesh inside. 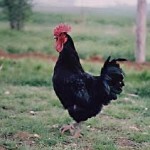 Berry has produced two black animals – the Poule Noire du Berry (chicken) and the Âne Grand Noir du Berry (donkey). 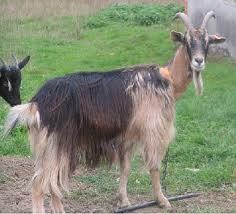 And a also brown and black goat, the Cou Claire du Berry. There’s even an association, the Union pour la préservation et la valorisation de Ressources Génétiques du Berry, which is actively working to make sure none of these animals, or the sucrine, die out. 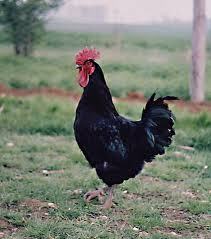 It’s rather nice to think such interesting things have originated in our part of France. Today’s saint: St Maxime (sometimes also commemorated on 22 November). He used to torture and execute Christians, but was converted by Saint Valérien while guarding him and his brother Tiburce in jail. He was martyred some months later with Valérien and Tiburce. Famous French person born on this day: in 1773 Jean-Baptiste Guillaume Marie Anne Séraphin Joseph, comte de Villèle. He deserves a mention for that name only! He was a politician, very influential between 1821 and 1828. 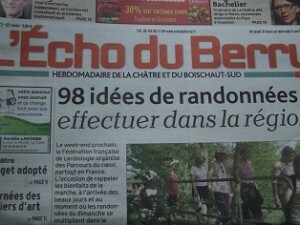 [ The Echo du Berry comes out on a Thursday. It’s one of our local weekly papers, and probably the most popular. Everyone seems to read it. The Echo itself reckons it has around 60,000 readers for the 13,300 copies it sells each week (2010 figures). Since it covers an area with a population of 110,000, that’s a pretty impressive readership figure.